One of the most notable aspects of Kylo Ren's character is his obsession with Darth Vader, evident in how he prays to Vader's charred helmet, how he tries to emulate him by wearing a mask, and even trying to obtain Anakin's lightsaber at the end of The Force Awakens. Luke confronts Kylo Ren on Crait, we see Luke wielding the blue lightsaber. While Luke probably did not know that the ligthsaber in question had been destroyed earlier, a common explanation that I have heard for why Luke chose to appear with a blue lightsaber instead of his green one was in an effort to taunt Kylo, since he coveted the weapon. However, I don't recall Luke ever mentioning that Ben was obsessed with (or at least interested in) Vader while Luke was training him; only that Luke had sensed darkness in Ben and that Snoke had already influenced him. In addition to that, I could not find any footage of Rey ever saying anything about it to Luke. Is there any extant material to indicate that Luke was aware of Kylo Ren's obsession at any point? 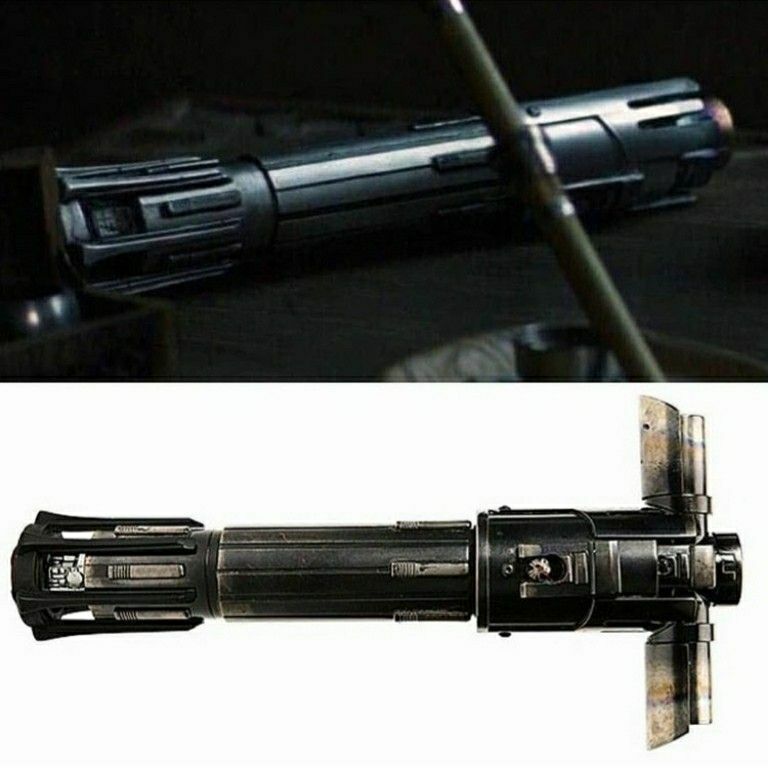 If so, is there any indication that Luke chose to display the blue lightsaber for this reason? Ben never knew that Darth Vader was his grandfather when growing up (as Leia, Luke, and Han never told him) and presumably when he was training with Luke. This is mentioned in the canon novel, Bloodline by Claudia Gray when Leia's parentage is revealed publicly and Leia sends a message to her son to comfort and explain why she kept this truth from him. a) Ben Solo's fascination with Darth Vader was probably motivated after learning his true lineage but Ben (as Kylo) only recently started his obsession over his grandfather after he attacked Luke's Jedi school. b) Ben modified his lightsaber, cracking the kyber crystal in the process and giving it a crossguard look after he attacked his uncle and fellow pupils, meaning his image of being a Darth Vader-look alike didn't start until after this particular event. If so, Kylo Ren's motivation to become like his grandfather never occurred during his training years with Luke but after he joined the First Order around the age of 23. Thus, I believe it's a logical conclusion that any knowledge Luke has of Kylo's fascination with Vader occurred after his nephew's fall and moreover, would explain why Luke never mentions any sort of obsession with Vader during Ben's training (within the films at least). We also know very little about the gap years between Episodes 6 and 7; I'm sure that perhaps in the future, more material will be released explaining Luke's knowledge regarding his nephew's fall. I have seen many explanations regarding this statement; however, the main point is that Luke just brought the lightsaber to anger Kylo, to remind him of his past (of which Kylo Ren is desperately trying to get rid of). Not the answer you're looking for? Browse other questions tagged star-wars the-force-awakens the-last-jedi luke-skywalker or ask your own question. Does Kylo not know the fate of Darth Vader? What is Kylo Ren's relationship with Darth Vader? Does Kylo Ren know that Darth Vader reconciled with Luke? Has Kylo Ren communed with Darth Vader before? What does Rey know about Darth Vader?